Leyard and Planar announced they will showcase the industry’s latest advancements in integrated video processing at InfoComm 2018 booth C2520. The Leyard DirectLight X LED Video Wall System and the Clarity Matrix G3 LCD Video Wall System are comprehensive video wall solutions that incorporate the latest in 4K video standards, advanced video processing and web-based control that enable dynamic, multi-source video walls, right out of the box. Leyard DirectLight X and Clarity Matrix G3 build on the success of these award-winning LED and LCD product lines with the new, off-board Leyard Video Controller that takes built-in video processing to a new level. The Leyard Video Controller incorporates video wall scaling with Planar Big Picture Plus video wall processing, allowing users to display content across the entire video wall, a portion of the video wall or in custom recallable layouts. The flagship LED and LCD video wall solutions further simplify installation and management with new Leyard WallDirector, a web-based user interface that streamlines video wall set-up, configuration, operation, and monitoring. Both solutions also come with Leyard WallSync, a set of technologies that facilitate video playback across entire video walls with perfect synchronization. Leyard and Planar will demonstrate all of these technologies at InfoComm 2018 booth C2520. •Leyard DirectLight X 0.7: This display breaks new ground as the finest pitch LED video wall display in the industry—offering a breakthrough pixel pitch of just 0.7 millimeters. Leyard DirectLight X 0.7 provides high resolution images at the closest viewing distance, and allows for 4K and 8K resolution video walls in smaller spaces, matching the pixel density seen in traditional control room video walls but with a completely seamless and uniform image. •Leyard TWS Series: A family of versatile ultra-fine pitch LED video wall displays available in 0.9, 1.2, 1.5 and 1.8 millimeter pixel pitches, the Leyard TWS Series features a convenient 27-inch diagonal size with an all-in-one design to fit a broad range of environments. The Leyard TWS Series is lightweight and easy to handle, making it an attractive solution for applications where traditional, hanging or curved video walls are required. •Leyard TVF Series: The Leyard TVF Series is a family of fine pitch LED video wall displays available in 1.5, 1.8 and 2.5 millimeter pixel pitches. With a 27-inch, slim-profile display cabinet, the series features front serviceability and a creative, stackable design that eliminates cabinet-to-cabinet cabling and reduces the complexity of installation and vertical alignment. 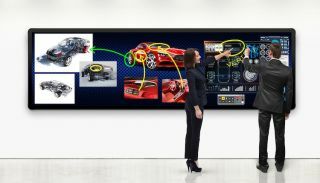 •Leyard LED MultiTouch: The Leyard LED MultiTouch is the industry’s first completely seamless interactive LED video wall. This proprietary multi-touch solution revolutionizes interactivity for narrow pixel pitch LED video walls without the disadvantages of front glass. Available in 0.7, 0.9 and 1.2 millimeter pixel pitches, it offers a seamless, smooth, lightweight and durable LED touch surface that delivers superior visual performance. •Leyard VersaLight Series: This new, highly versatile family of LED video wall displays can turn even the most challenging environments into dramatic, inspirational video walls. With pixel pitches ranging from 2.5 to 8 millimeters, the modular line of indoor and outdoor LED digital signage displays offers stunning picture quality and ultra-reliable performance. •Leyard CarbonLight CLI Series: This line of lightweight, flexible LED video wall displays is ideal for indoor rental, staging and flexible-fixed applications. The Leyard CarbonLight CLI Series has expanded to include a 1.9 millimeter pixel pitch option—extending the existing 2.6, 3.9 and 5.2 pixel pitch models. In addition, the series now offers easy front service to accommodate even swifter upkeep and maintenance. •Leyard CarbonLight CLM Series: The Leyard CarbonLight CLM Series is a line of see-through mesh LED displays designed for rental, staging and flexible-fixed applications in indoor and outdoor environments. Available in 6.9, 10.4 and 15.6mm pixel pitches, it is lightweight with high transparency and low wind resistance.